I’ve been thinking a LOT about goals for 2019 and discussing this with colleagues, as well as my Pursuing Private Practice course students in our Facebook group. So many professionals feel motivated this time of year to get work done! Why not take advantage of the momentum this time of year and get to work on the things that will move your private practice forward. 1. An annual calendar. I wrote about this topic last month but it deserves another shout out! Many of my Pursuing Private Practice students have said the workshop I did in December was so helpful. I never really thought about my “year’ all in one sitting until last year when I participated in my own annual calendar planning workshop. Back then, I usually made goals for my private practice on a month-to-month basis. I thought I was going to feel overwhelmed, but looking at the year as a “whole” was really helpful. 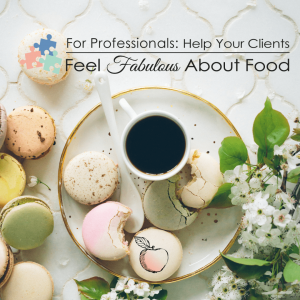 I was able to think about upcoming vacations and personal time, as well as big projects for the practice and my nutrition course Feel Fabulous About Food and my entire online business for professionals (this is everything I offer to professionals!). I organized my calendar months by “themes” so each month I am able to put out content that makes sense for my private practice and the clients I want to attract. I felt so organized going into 2018 and it PAID OFF big-time both by saving me time and making me more money. 2. Business books to read. I know not everyone is a reader, but books can contain valuable advice to put into practice in your business and life. Choose at least 2-3 books to ready every year, more if you can handle it, and finish them. Some of my old favorite books from previous years are Your Best Year Ever. Last month I finished Greg McKowen’s Essentialism (I read it to help me with life but the book ended up speaking to me more about business!) A new book that I can’t wait to read is Hal Elrod and Cameron Herold’s Miracle Morning (for entrepreneurs!). When you pick a book topic that speaks to you, it will help you brainstorm the next strategic plan for your private practice. It can also give you ideas and creative solutions for common problems in business. 3. A networking event. Private practice is all about referrals and making connections within your community. Networking is key because it will allow you to get your name out there, as well as start the process of getting professionals to trust your brand and skills. From there your client referrals will skyrocket! Find a networking event in your desired community and if you can’t find one, create one to host professionals that you want to get to know! A lunch or coffee date is a perfect excuse to get like-minded professionals together to create lasting relationships. Keep in mind that if you do work virtually, a “coffee chat” over video can be just as effective as a real-life meeting. Next up for me is the WIND conference in NYC Saturday, February 9th! This Weight Inclusive Conference for Nutrition and Dietetics is SOLD OUT! But WIND just opened up a virtual option for just $99! Hear me and 2 other fabulous presentations for just $99. You can register for the virtual option here. If you want to skyrocket your private practice in the new year, get additional support and training with the Pursuing Private Practice course. We just started our Facebook group discussions about the modules so it’s a great time to join!